Sean Spicer says Trump will discuss the Regulation Law directly with Prime Minister Netanyahu. 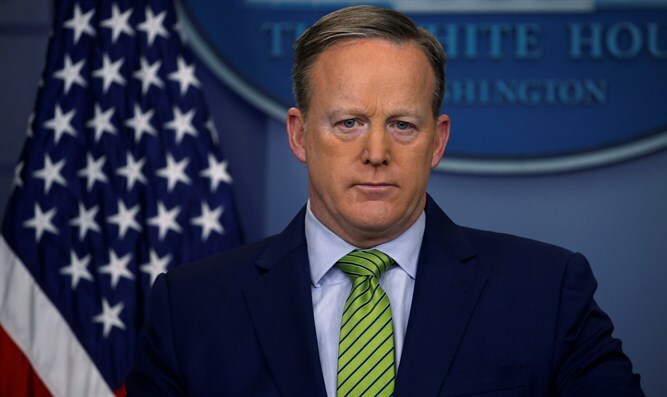 White House spokesman Sean Spicer on Tuesday refused to take a stand on Israel’s approval of the Regulation Law, saying President Donald Trump would discuss the issue with Prime Minister Binyamin Netanyahu during their meeting next week. “Prime Minister Netanyahu will be here on the 15th. I think that will be obviously a topic of discussion right now. I don't want to get ahead of that,” Spicer told reporters in his daily press briefing, when asked if the administration would take a position on the Israeli legislation. Similarly, a State Department official refused on Monday night to comment on the approval of the law, telling AFP that the administration was “withholding comment” in the meantime. "The administration needs to have the chance to fully consult with all parties on the way forward," the official told the news agency, on condition of anonymity. "At this point, indications are that this legislation is likely to be reviewed by the relevant Israeli courts, and the Trump administration will withhold comment on the legislation until the relevant court ruling."